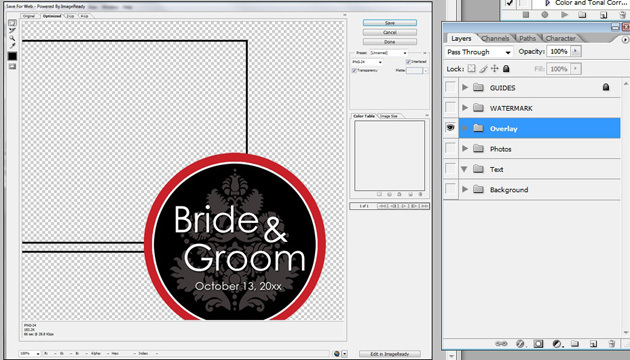 Editing our Photo Booth Templates take very little Photoshop Skills. We will show you the steps below. 1. Once you have signed up for an account, purchase and download the template that you would like to use. 2. Once you downloaded and extract the files from main.zip or template.zip, there will be a Template folder and all the files you need resides in that folder. 3. When you go inside the Template folder, you will noticed there are three .txt files. The terms.txt is the same one you agreed to on our website during registration. The coordinates.txt is the file will all the x/y coordinates as well as width/height for each photo that you will need for your Photo Booth Software. Lastly, the readme.txt file contains all the information you would need to edit this template. You might need to download and install fonts from the URL provided in this file. This file will also include any special instructions if required. 2. The GUIDES layer is hidden by default, as you can see by the missing eye icon on the left hand checkbox. When you click on the empty checkbox on the left, the red guide will show where the bleeding section is for the printer. Try to avoid having any text or graphic on that section because they might not show up in the final print. 3. The next folder is the 'WATERMARK' folder. This is where we put the watermark for this template. By default, there is a 'DELETE' folder that holds the PhotoboothTemplates.co logo which you may disable by hiding the folder. You will also find a 'Your Logo' folder. 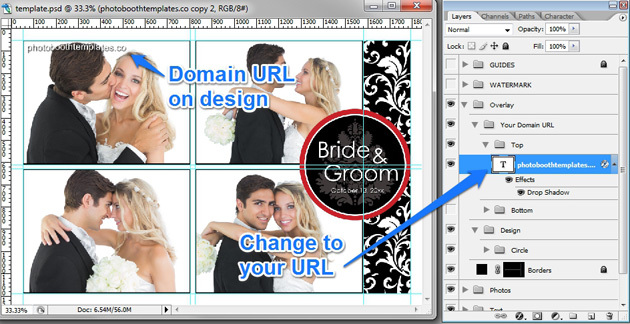 This is where you can place your own logo that can be used as a watermark on the printout if you choose to do so. 4. 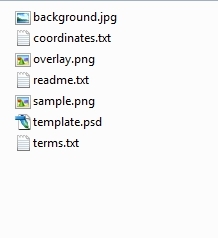 Now we will move on to 'Overlay' folder which is the main folder that is used to generate the overlay.png file. Right under this folder, you will notice the 'Your Domain URL' folder, depending on your template layout, you may also see a top/bottom or left/right folders which contains the URL text layer. 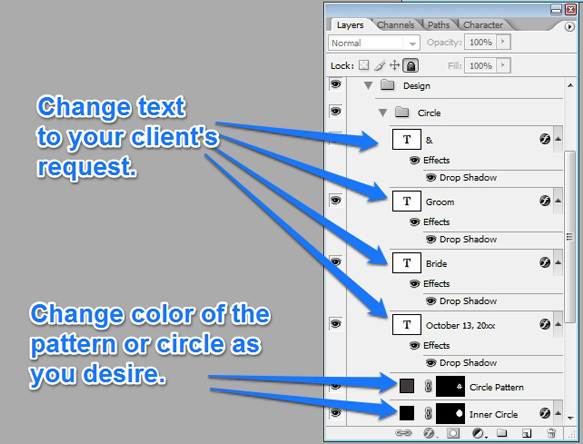 It is easy to change this text layer simply by using the Text tool from Photoshop. It is a good idea to include your company website using this subtle fashion because most guests will want to know where to find the online gallery. 1. Inside the 'Overlay' folder, there is a 'Design' folder where most of the design element for the overlay.png will be placed. For this template, there is a 'Circle' folder which contains the monogram design. Also, there is a 'Borders' layer that allows you to change the border color around each photo. By default the border color is black if it exists. Also, this 'Borders' layer is locked by default, you will need to use the 'lock/unlock' button shown below to utilize this layer. 2. Let's look at the 'Circle' folder which contains the monogram design in this template. There are 4 text layers that you can change with the Photoshop Text tool (make sure the font is already installed from the readme.txt file). Also, there are two color adjustable design patterns underneath the text layers that you can edit. 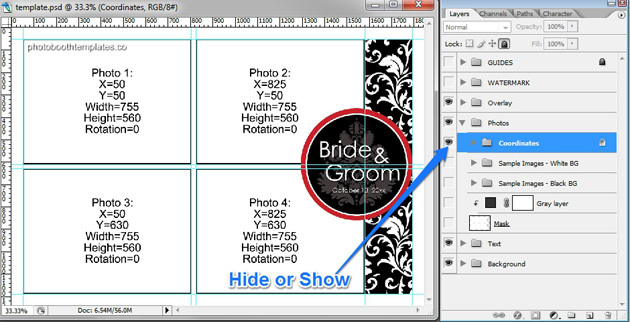 Most designs in templates uses adjustment layers so that it is easy for you to simply click on the color box on the left hand side of the pattern and select the color you want. 3. Right underneath the 'Overlay' folder you will find the 'Photos' folder. This folder allows you to see the actual coordinates value in the 'Coordinates' folder. You can simply show or hide it by clicking on the eye icon like you did in previous steps. 4. 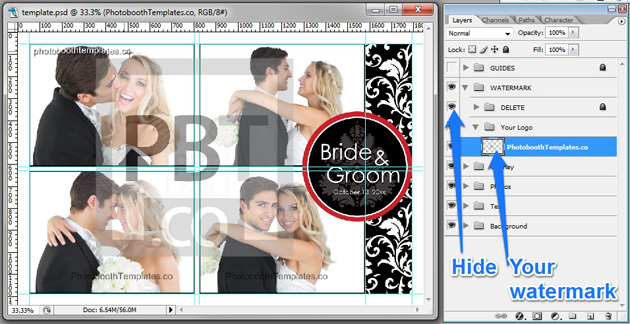 This folder also includes sample images that you can save samples for your client during the proofing process. By default we have two folder for sample images. However, we recommend all of our designers to use their own, so there might be one folder instead of two. In this case, you see two folders, one with sample images in white background and the other in black background. 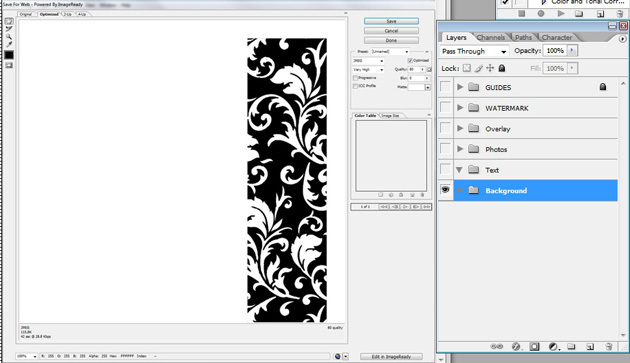 The reason for that is to allow our designer to show the backdrop colors that would best match the template. We suggest solid colors as background. 5. Normally, we will talk about the 'Text' folder which is where all the text should be located for the design. However, for this template, there are no text layers inside the 'Text' Folder. Also, on some occasion such as the template we are currently working with, some text layers could end up in Overlay layer simply because of how the designer wish the text to be displayed. 6. The next main folder we will talk about is the 'Background' folder. This folder contains the main design for the background.jpg file and usually is the most important folder in the template. Just like the 'Overlay' folder, there is a 'Design' folder inside. 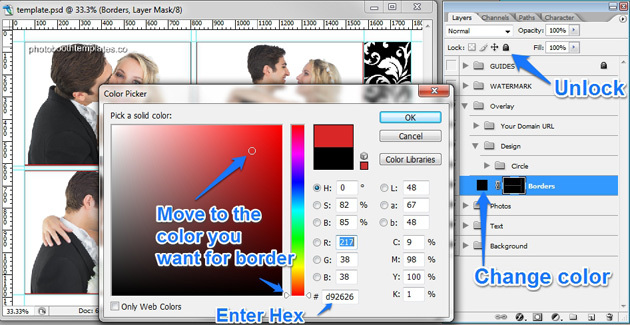 In this example, the pattern design has a color adjustment layer that allows you to change the color by clicking on the color box on the left hand side just like Step 9 above. 7. 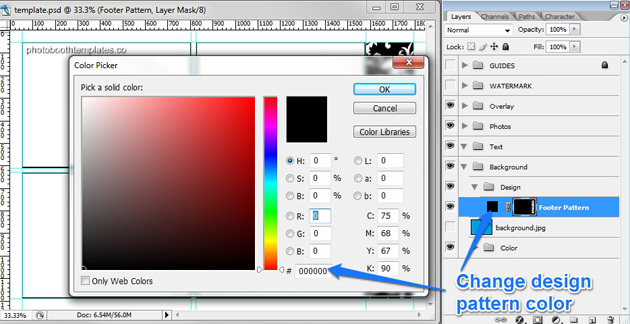 After that we will focus on the 'Color' folder which contains the background colors. There is a background.jpg color that you can change to any color you want, but we typically don't use this layer so we leave that up to you. As you can see from the image below, there are 3 folders and we will look at each one individually. The first folder 'Simple' contains 3 simple colors, Black, Grey and White. These are the most popular options for standard designs. Next we have the 'Inspiration' folder, this folder contains several folders of popular color theme that you should try to use to adjust the color scheme of the design. Lastly, it is the 'David's Bridal Full Spectrum' folder. This folder contains all the color your client will be asking for. The color inside this folder will match most of the invitation designs out there and the name of the colors are sorted in alphabetically order. 1. 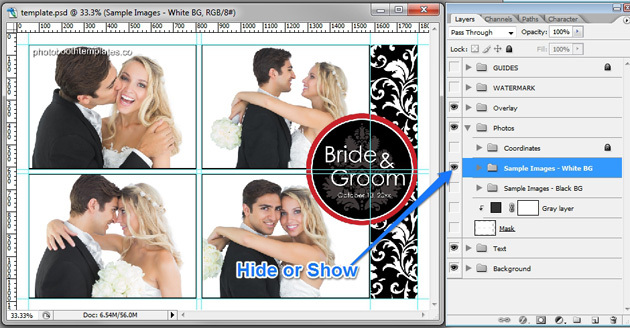 The final step is to save the template into image files so you can import it into your Photo Booth Software. 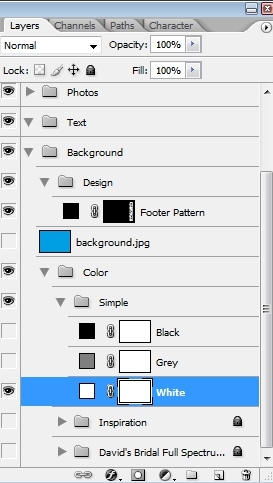 The first thing you need to do is save the overlay.png file by hiding all the folder except the Overlay folder. Then use the 'Save for Web' option and select the 'PNG-24' preset and overwrite the current overlay.png file in your template folder. 2. Finally, we need to save the background.jpg file. You do that by hiding all the layers except the 'Background' layer and use the 'Save for Web' function with 'JPEG' preset and quality around 70-90%. 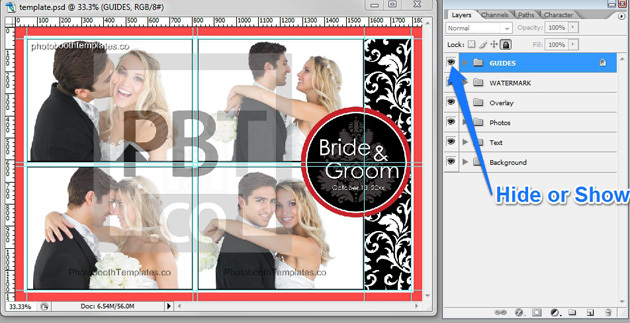 That's all there is to it, now your template is ready to be loaded into your favorite photo booth software. You can learn how to do that in the Import a Template section.